Saturday, February 23, 2019 at 2:00 – 4:00 p.m. Beyond the dramatic events at the southern border, the US immigration system is in the midst of a far-reaching transformation that has implications for anyone seeking legal permanent residency for themselves or their families. 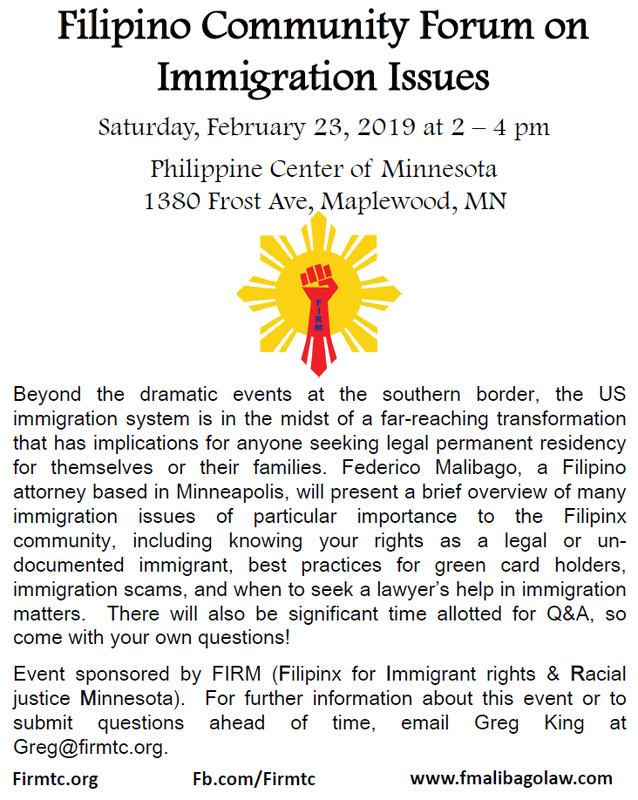 Federico Malibago, a Filipino attorney based in Minneapolis, will present a brief over view of many immigration issues of particular importance to the Filipinx community, including knowing your rights as a legal or undocumented immigrant, best practices for green card holders, immigration scams, and when to seek a lawyer’s help in immigration matters. There will also be significant time allotted for Q&A, so come with your own questions! Event sponsored by FIRM (Filipinx for Immigrant Rights & Racial Justice Minnesota). For further information about this event or to submit questions ahead of time, email Greg King at Greg@firmtc.org.